The 8ft (2.5m) statue by Barnsley sculptor Graham Ibbeson was revealed on Saturday morning by players from the 1972 cup-winning team. Leeds United beat Arsenal 1-0 to win the centenary FA Cup at Wembley. The statue stands in an enclosed location opposite the ground's East Stand and weighs about 30st (200kg). Revie's son Duncan said the statue was a "great honour and tribute" to his father and "that wonderful team". He said: "That era was a golden era for Leeds." The Revie family were involved in providing guidance and pictures of Don Revie to help the sculptor produce the statue. Don Revie had a playing career of more than 400 games at clubs including Manchester City and Leeds United and he won six England caps. He signed as a player for Leeds United in the late 1950s and was then appointed manager in 1961. He even changed Leeds' playing kit to all-white in emulation of Real Madrid, a move that seemed optimistic at the time but Leeds became one of the top teams in England under Revie in the 1960s and 70s. Revie's team, which included international players such as Billy Bremner, Johnny Giles, Jack Charlton, Peter Lorimer, Norman Hunter and Allan Clarke, won the league in 1969 and 1974 and also won the FA Cup, League Cup and two European trophies. A statue to Billy Bremner already stands outside Elland Road. Revie's methods were sometimes controversial and, outside the city, the team gained the nickname 'Dirty Leeds' through its uncompromising style. In 1977 Revie resigned suddenly from the England manager's job to take over the United Arab Emirates team. Revie died of motor neurone disease in 1989 aged 61. The sculptor Graham Ibbeson has provided statues of other Yorkshire sporting heroes including cricket umpire "Dickie" Bird, in Barnsley, and fast bowler Fred Trueman, in Skipton. His most famous statue is often said to be of comedian Eric Morecambe on the seafront at Morecambe. Ibbeson was also the sculptor of Leeds' tribute to Arthur Aaron VC, the city's only recipient of the Victoria Cross during World War II. The medal was awarded posthumously after the pilot's death flying in an 1943 air raid. 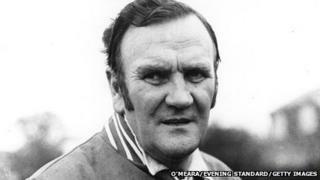 All profits from the events at the statue unveiling in Leeds will be donated to motor neurone research in memory of Don Revie. Pitch to Plinth: Why do sporting statues exist? Why do sporting statues exist?